Mount Pleasant Winery – HUGE BLOW-OUT Sale this week only (December 26 – December 31st). Tons of merchandise items at 50% off! We are open the rest of December, Monday thru Saturday from 9 am – 6 pm and Sunday from 10 am – 6 pm. Monday, New Year’s Eve, Dec 31st, we will be open from 9am – 4 pm. Don’t forget to come by and enjoy a glass of wine on Saturday the 29th and enjoy the music of Mary Ann and Jay Daversa playing live for you from 3 – 5pm! We wish for all of you a very Happy and Safe New Year!!! Disclaimer: BroadcastBranson.com is a service for the distribution of press releases, news and events. BroadcastBranson.com does not verify the validity or accuracy of the contents of the news that it distributes. Users are responsible for the contents of the press releases they submit to BroadcastBranson.com and the distribution via our service does not imply endorsement. BroadcastBranson.com takes no responsibility and holds no liabilities for information distributed. We are pleased to announce that the Tony Roi “ELVIS & MORE” Show will be hosted at the Jim Stafford Theatre for the 2013 season. “We couldn’t be happier about being there,” says Roi. “They are a class act in every aspect of the business and they know how to take care of their guests in the theater! When you think of Branson…you think of Jim Stafford and we are so pleased to be associated with him and his theater,” adds Roi. We will continue to post updates on Tony’s website (www.thetonyroi.com) and his social media sites as well. New season will begin in March of 2013. We look forward to seeing you all there! 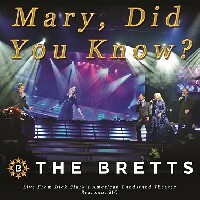 The Bretts Show, Branson’s Best Christmas Show (bransonbloggers.com), just released a new video of this years heart stirring grand finale “Marry, Did You Know? / O Holy Night,” on their YouTube channel. 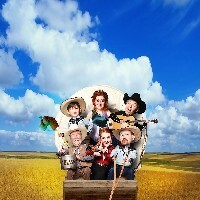 Visit http://www.youtube.com/thebrettfamily to see their powerful new arrangement. Enjoy! Some of Branson, Missouri’s finest musicians will perform for a final meal and show in celebration of the Circle B Supper Show on December 27, 2012. During the last nine years in Branson, the Circle B has featured many world class entertainers. Several of them will perform together onstage in a rare farewell hoedown. The show will feature four award-winning fiddlers: Louis Darby, Nathan Agdeppa, Junior Marriot, and Billy Ward. Fans will recognize the names of multiple-state and international fiddle champions Darby, Marriot and Ward. Many know Nathan Agdeppa as a performer with the Baldknobbers Jamboree, and Roy Rogers, Jr.. Kathleen Lawson (neé Horn), Circle B’s original comedienne and superb soprano vocalist will be among the performers for this special performance. This special farewell celebration will also include multi-instrumentalist and yodeler John Fullerton. There will also be a special guest appearance by “Branson’s Guitar Wizard”, Leroy New. All of the special guests above will join one of Branson’s funniest ensemble, musical casts: guitarist Earl Vaughan, bassist Christiana Horn Cordova, vocalist and emcee Kemp Horn, Irish dancer Megan Horn and guitarist Michael Horn. The core of the Circle B group has always been the Horn family. Kemp and Michele Horn purchased the Circle B Chuckwagon in Rapid City, South Dakota in 1993. The Horn family moved to Branson to open the Circle B Supper Show in 2003. In 2005, Circle B was given the Editor’s Choice award for Must-See show of the year by Branson Show Awards. Over the past nine years in Branson, the Circle B Supper Show has entertained hundreds of thousands of Branson visitors with a down-home comic manner and upbeat live music. Circle B was recently recognized by TripAdvisor.com as providing a highly-rated experience for guests. The Horn family is grateful for their fans’ support. The Horn’s also wish to extend thanks to the Branson entertainment community for accepting them into the Branson show family. Guests should arrive by 4:30 PM for supper seating. The show will begin at 5:45, and will last until approximately 7:30. The cast-members have chosen some of their favorite tunes and humor from almost twenty years of performing for Circle B. Expect harmony fiddle breakdowns, fan-favorite vocal tunes, Irish step-dancing, and an all-star version of Orange Blossom Special to close the show. Tickets for this special supper and performance will be $45 plus tax for adults. The cast and crew hope that all of Circle B’s loyal fans will join us for this special program. Please call 1-800-678-6179 now for tickets. This special performance will take place at the Branson Central Theatre at 625 S. Hwy. 165, next to the Acrobats of China. Branson-Hollister VFW Post 11290 recently sponsored a Patriot’s Pen writing competition among area schools. The essay contest asked middle school students to write on the topic “What I Would Tell America’s Founding Fathers.” The writing competition is also sponsored nationally by VFW. The students are under the instruction of Junior High history instructor John Mathews. The students were presented awards by local Post 11290 representatives Gerald Long and Richard Baehr. District winners advance to state competition early next year. 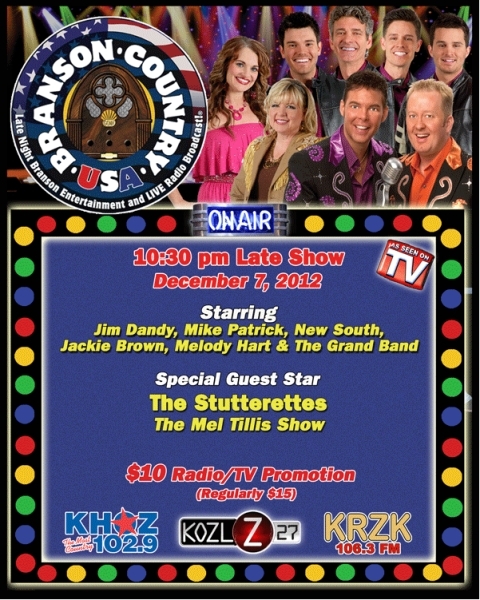 Branson Country USA is co-hosted by Grand Country nuts, Jamie Haage, as Jim Dandy, and Mike Patrick! With a rotating roster of talent, the show features special guest stars from the rich Branson entertainment industry. From celebrities such as Mickey Gilley and Roy Clark to the up-and-coming stars of tomorrow, the weekly line-up is always a hit! Audiences also enjoy the incredible voices of Jackie Brown, Melody Hart and the power harmonies of New South, both weekly regulars on the show. The entire show is backed by the dynamic Grand Band. This show is broadcast on radio stations around the country. Airing Saturday nights at 7:00 PM on KRZK – 106.3 in Branson, MO. And Sunday nights at 9:00 PM. on KHOZ – 102.9 in Harrison, AR. 1945 W. 76 Country Blvd. 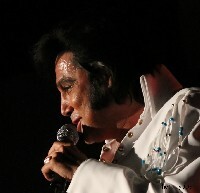 Tony Roi’s “Elvis & More” Show will be closing out the 2012 Season this Saturday December 8th at 8:00pm at the Caravelle Theatre in Branson. Be sure to call the Caravelle Theatre ticket office at (417) 334-5100 to get your tickets for Saturday night December 8th…it will be a fantastic show and a great night to end the season! Copyright © 2007-2019 Branson.com. All Rights Reserved.